Sweet with old sherry, nicely mixed with dark fruits, orange peel, dark chocolate and cocoa. Spicy notes of oak, nutmeg and cinnamon arrive followed by gingerbread and a whiff of sea salt in the back. Bold and intense on the palate with a warming mix of dried fruits, sherry, Demerara sugar and prunes. This is accompanied by dark chocolate, cinnamon, cardamom and a hint of nutmeg with a certain nuttiness towards the finish. Very harmonious and velvety. The finish is long, sweet and velvety with acacia honey, barley sugar and almonds. Becomes drier on the tail with cocoa, tobacco leaves and a whiff of saltiness. There's more sweetness coming through when a few drops of water are added, mixed with lots of sherry and spicy plums. The warmth and intensity is tamed on the palate while sweet and fruity notes of sherry and dried fruits are coming through, followed by bitter orange peel towards the finish. The finish is still long with honey, barley sugar, walnuts and dry notes of tobacco mixed with oak and cocoa. 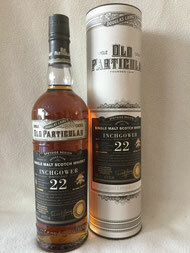 This single cask bottling of an old Inchgower impresses by its complexity of diverse aromas, such as old sherry, dried fruit and winter spices. No overloaded sherry aromas or too much influence of oak wood. Nothing dominates, everything's in perfect harmony. A powerful demonstration of the enormous potential of this unusual Speyside distillery by the folks of Douglas Laing.